I clearly remember back in the day when I had my very own Game Boy that I could call my own. Yeah, all the dot matrix goodness that came with a Tetris Gamepak, now those were sweet memories as I burned through quartets of AA batteries each time the holidays beckoned. Well, the years of experience with the beloved Game Boy also led me to find creative ways to remove the dirt and grime from the little “drains” at the back of the handheld console, with the blunt end of toothpicks being my main choice. 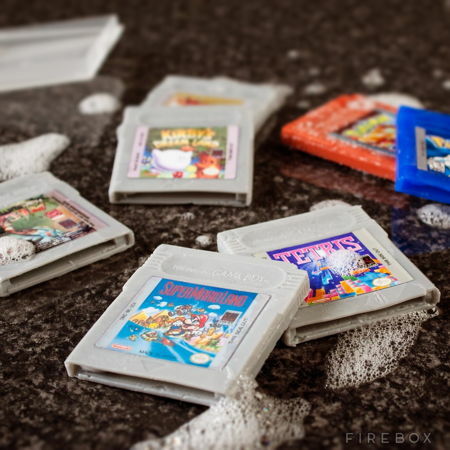 Here is a way to roll back the years while ensuring that your gaming hands remain nice and clean – with the £6.99 Game Boy Cartridge Soaps. You will be able to choose from the likes of Earthworm Jim, Kirby’s Dreamland, Pokemon Blue, Pokemon Red, Super Mario Land, Tetris and The Legend of Zelda. These are 100% soapy life-size recreations of classic Game Boy Gamepaks.